If you love to cook, you’ll definitely want to invest in high-quality bamboo cutting boards. These products are tough enough to handle daily use and can be utilized to chop or slice various ingredients. They’re less porous than some hardwood and absorb less liquid than traditional wood boards, which means they won’t easily crack, split, and stain. They will also look good over time. One of the best things about bamboo cutting boards is their density. This prevents them from getting scarred by knives, and they develop fewer grooves as a result. Since bacteria like salmonella and E. coli usually grow in these grooves, it’s easy to see that bamboo boards are more hygienic and are better at promoting food safety than other types of cutting boards. If it’s your first time to buy bamboo cutting boards, you might find it difficult to choose the right product that best fits your needs and budget. There’s no need to worry, though, since we have prepared a detailed guide to help you select the best bamboo cutting board for you and your kitchen. When shopping for bamboo cutting boards, you should first check the materials that are used to make them. There are several species of bamboo that can be used in making cutting boards, but the most preferred is Moso. This species is known for being solid and durable, and it can result in products that can withstand daily use and last for a long time. Many cutting boards are made with glue that contain formaldehyde, which can cause poisoning and lead to various health problems when ingested. So, as much as possible, choose boards that are made without any adhesives. If a certain board catches your eye and you find out that it’s made with adhesives, make sure to check that they are food-safe. Aside from checking for formaldehyde, you should make sure that your cutting boards don’t contain phthalates, BPA, and other harmful chemicals. If the boards have a finish, ask the manufacturer if they use a natural finish like sunflower oil instead of artificial ones. By taking these steps, you’ll get to buy products that are safe to use and won’t harm your health. You should also decide on the features that you want your cutting boards to have. Doing this will help you narrow down your choices and make shopping a lot easier. Some cutting boards have handles or handle cutouts, which make them easy to hold and allows you to hang them on nails or hooks. A few even have silicone lining on their handles, which add a pop of color while making them easier to grip. Others, meanwhile, are simply blocks of wood without any handles, which increases their aesthetic value but makes them more difficult to store. Do you want your cutting boards to have grooves or not? Grooves can collect the juices that run off from meats, fruits, and vegetables as you slice them and prevent these liquids from dripping to your countertop. This, in turn, minimizes the mess you’ll have to clean up after food preparation tasks. Grooveless boards, on the other hand, are slightly easier to clean and can easily double up as serving platters since people won’t be able to tell that they’re cutting boards. Another feature you might want to consider is removable mats. Bamboo cutting boards have to be hand-washed since they get easily damaged when exposed to the heat from dishwashers, and this increases the time you spend on post-cooking cleanup. To solve this problem, you can buy cutting boards with removable mats that you can simply throw into the dishwasher after each use. You’ll need to choose between bamboo cutting boards that are pre-treated and those that are not. Pre-treated boards get a mineral oil treatment before they leave the factory, which means they’re ready to use when they arrive at your doorstep. Boards without pre-treatment, on the other hand, must be oiled before you can use them. Pre-treated boards are highly convenient, but you may also prefer non-treated ones since you can ensure the quality of the mineral oil that you use. Take note, though: no matter what type of cutting board you buy, you have to regularly oil it to keep it in great shape. Of course, you have to decide on the design of your bamboo cutting boards. Some have a solid color, while others feature a two-tone design. Both of them look good, so choose one that best fits your aesthetic preferences. These cutting boards are made of three crisscrossing layers of bamboo. This makes them up to 50 percent thicker than two-ply boards and ensures they’re highly durable and warp-resistant. The large and medium-size boards have handle cutouts that make them easy to store, since you can simply hang them on nails or hooks after using them. The smallest board doesn’t have a handle cutout, which makes it perfect as a cheeseboard or a serving platter. Despite claims of the cutting board falling apart easily or developing splinters, the ZenWare 3-Piece Triple-Ply Bamboo Cutting Board Set remains durable and sturdy. If you properly take care of your set, it’s highly likely that it can last for a long time. If nothing else, the low price point should convince you to give this product a try. Small board measures 10” x 6”, cutting board measures 12” x 8”, and carving board measures 12” x 15”. The Vremi 3 Piece Bamboo Cutting Board Set is made of organic bamboo. The large board is ideal for slicing and dicing multiple ingredients at the same time, while the two smaller boards are great for preparing single-ingredient recipes or serving cheese, crackers, or deli meats. All three boards come with silicone hanging holes for easy storage, and they’re built with grooved juice wells that catch liquids from meat, fruit, and vegetables. Some buyers have reported that the boards easily break into pieces. If this happens, make sure to let the manufacturer know to get a replacement or a refund. The Vremi 3 Piece Bamboo Cutting Board Set can be a great investment since they can double as attractive serving platters. Vremi’s customer care team easily responds to customer complaints, so you can seek their assistance if you have any problems with the board. Cleaning and maintenance are some of the biggest issues with bamboo cutting boards since they require hand-washing and drying. The Seville Classics Bamboo Cutting Board gets around this problem with its removable BPA-free mats, which are dishwasher-safe and are easy to clean after use. The mats are color-coded for cheese, poultry, fish, and other ingredients, allowing you to prevent cross-contamination from raw proteins to other kinds of food. They can be stored inside the board’s unique storage compartment when not in use. The Seville Classics Bamboo Cutting Board has some imperfections. But, if you want to get a bamboo cutting board that’s easy to maintain, this can be a great buy for you and your family. 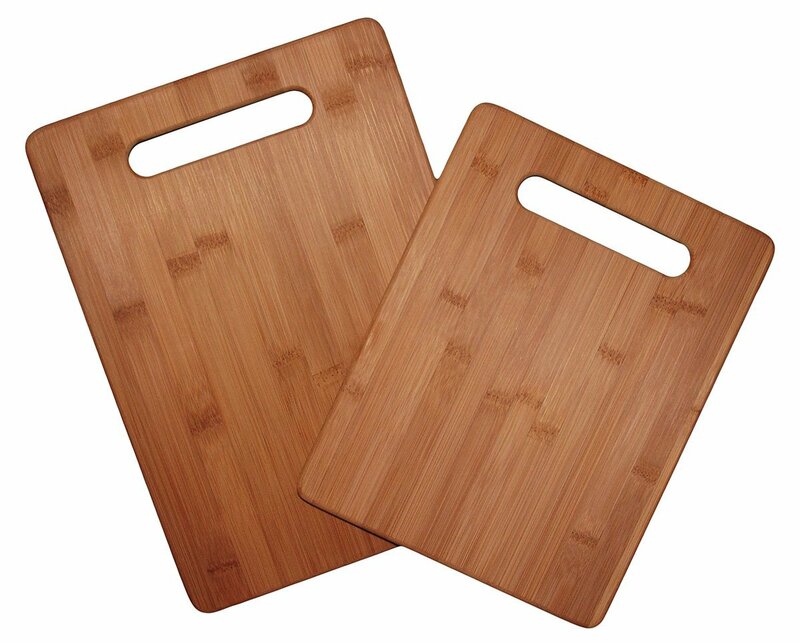 The Totally Bamboo 2 Piece Cutting Board Set is made of Moso bamboo, which doesn’t easily absorb moisture. Because of this, the boards don’t easily shrink or swell, even when frequently exposed to liquids, and can last for a long time with proper care. Despite their density, the boards are not too heavy compared to standard wood cutting boards, making them great for daily use. Totally Bamboo uses non-toxic and FDA-approved adhesive to make its cutting boards, which means they are food-safe and won’t expose you to harmful chemicals. 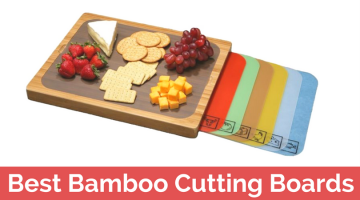 The Totally Bamboo 2 Piece Cutting Board Set is an excellent option if you’re looking for lightweight cutting boards that you can easily prop against the wall or hang on a hook when not in use. Since the boards can double as serving platters, you can get a lot of use out of them. The Farberware Classic 3-Piece Bamboo Cutting Board and Serving Set has reversible cutting surfaces, which means you can use one side for raw proteins and use the other for fruits, vegetables, and herbs. As a result, you can prevent bacteria cross-contamination from meats to non-meat ingredients and maintain food safety — without having to use different cutting boards. The boards don’t have handles or handle cutouts, which can be a disadvantage since you can’t hang them on your kitchen hooks. However, this can also be a plus since the boards can double as excellent wood platters, and you can use them to serve appetizers and other food. Unless handles are a number-one priority for you, the Farberware Classic 3-Piece Bamboo Cutting Board and Serving Set is an excellent investment. 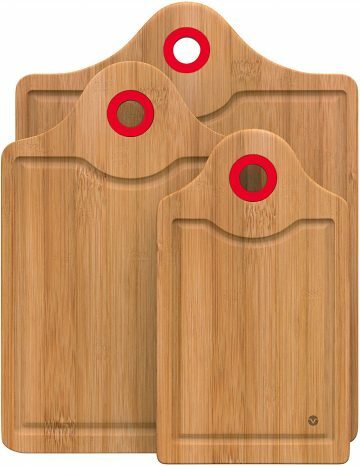 The three different-sized boards included in the set give you a range of options and will meet your food preparation needs. The Utopia Kitchen Extra Large Bamboo Cutting Board has plenty of space for ingredients, making it ideal for those who prepare multi-ingredient recipes and/or cook large batches of food in one go. It’s made of Moso bamboo, which is known for its strength and sustainability, and is held together by food-safe glue that does not contain formaldehyde. Its beautiful finish comes from natural sunflower oil — not from toxic color paints. As a result, you can buy a beautiful cutting board that you can show off to guests, without having to worry about your health and food safety. If you’re in the market for a large cutting board, the Utopia Kitchen Extra Large Bamboo Cutting Board is an excellent choice for you. It does have a few design imperfections but, if they don’t bother you, you’ll find that the board is a great addition to your kitchen. 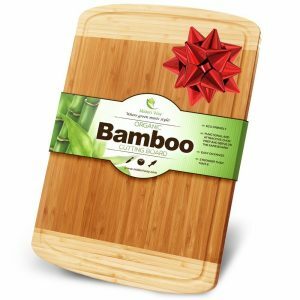 The Premium Bamboo Extra Thick Eco-Friendly Bamboo Cutting Board Set is made from recyclable and sustainable Moso bamboo. The boards all have white edges with a darker center, which gives them a beautiful, eye-catching look and makes them great as serving platters when you have guests. Some customers have complained that the boards easily break apart. If this happens, you can contact the manufacturer to get a refund or replacement. 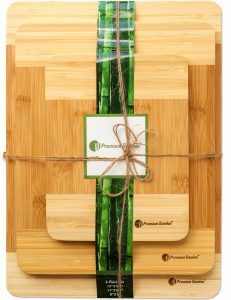 The Premium Bamboo Extra Thick Eco-Friendly Bamboo Cutting Board Set is a great choice if you’re looking for cutting boards that have a unique and attractive look and can be given as a gift. The manufacturer provides a 100 percent money-back, no-questions-asked guarantee if you’re not happy with the product, so you won’t lose anything if you’d give it a try. 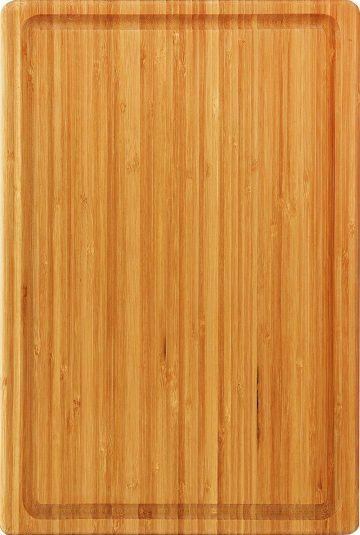 The Midori Way Thick Bamboo Wood Cutting Board is lightweight and durable and is a great addition to any kitchen. Its large size allows you to slice and dice numerous ingredients at the same time, making it easy for you to cook for many people or prepare large batches of food. The board comes with juice grooves that collect liquids from your ingredients and prevent them from dripping on the counter, giving you one less thing to clean. It’s also free from formaldehyde, phthalates, and toxic dyes and can help you maintain food safety. If you’re looking for a big cutting board, the Midori Way Thick Bamboo Wood Cutting Board should be at the top of your list. Its large size, coupled with its attractive design and chemical-free composition, makes it an excellent investment for you and your loved ones. 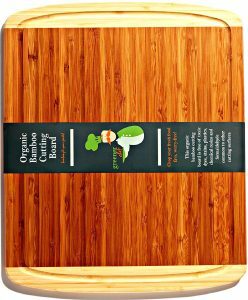 The Greener Chef Organic Bamboo Cutting Board is made of Moso bamboo that is harvested in a sustainable way. The board is FDA-approved and does not contain dyes, solvents, stains, lacquers, and BPA. Instead of using adhesives and sealants that contain formaldehyde, the manufacturer puts the board together by water-steaming bamboo strips and compressing them using natural plant resin adhesion. The resulting product is then cut and sanded to create a smooth surface. Since chemical-free processes are used, you have the assurance that your cutting board is free from harmful substances and will not contaminate your meals with toxins. Some customers complain that the board easily splits into two. You can contact the manufacturer when this happens to get a replacement. If eco-friendliness is your main priority, you won’t go wrong with choosing the Greener Chef Organic Bamboo Cutting Board. It’s harvested and manufactured using sustainable practices, which means you’re buying a product that has minimal environmental impact and can even be recycled once you no longer want it. The Totally Bamboo 3 Piece Bamboo Cutting Board Set comes with three boards in different sizes, so you can choose the size that best suits the task at hand. Each board is made of Moso bamboo that’s harvested using sustainable methods, and they’re manufactured using high-grade, FDA-approved adhesive that’s free from toxins. This gives you the assurance that you’re using food-safe products that won’t contaminate your food with harmful chemicals. Some customers complain that the boards split into pieces after light use. This can be prevented by oiling the boards before using them. 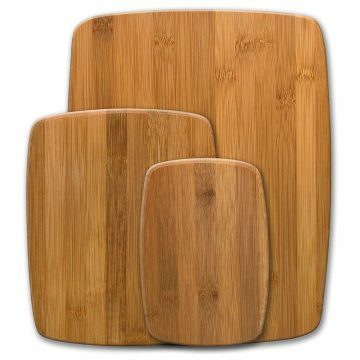 The Totally Bamboo 3 Piece Bamboo Cutting Board Set is the ideal choice if you’re looking for cutting boards that are solid and durable, but are also lightweight and easy to maneuver. Use them for all your slicing and dicing needs, or press them into service as serving platters or cocktail bar boards when you have guests over. A bamboo cutting board is one of the best things you can buy for your kitchen. With this product, you’ll find it easy to whip up delicious dishes and treats — without having to worry about hygiene and food safety.